Most MBA summer interns don’t work out of a converted bowling alley that looks like a psychedelic art installation met a futuristic funhouse, and then had a baby. But that’s exactly what Kayla Armgardt (MBA ’18) did this past summer. Armgardt officially interned for a boutique consulting firm called UpSpring Associates, but she worked exclusively on a client called Meow Wolf, a collective based in Santa Fe that employs more than 100 local artists. 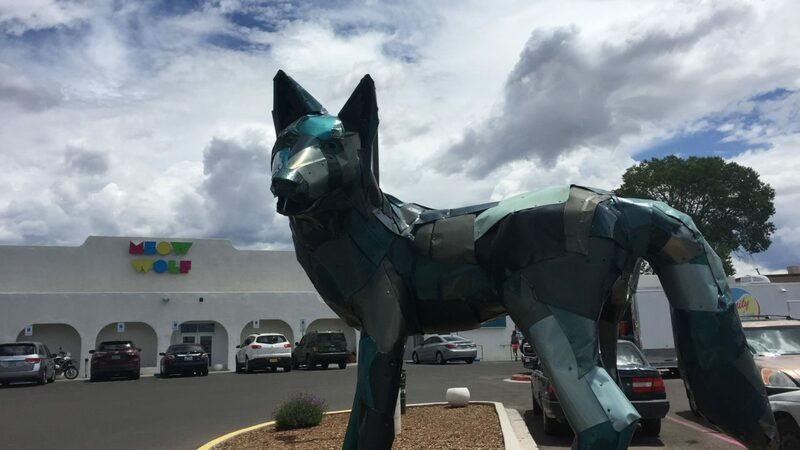 Meow Wolf also offers a non-profit education initiative called CHIMERA, which provides art classes for children and adults and helps kids develop job-ready digital skills. While Armgardt did work out of Meow Wolf’s more traditional office space, she also spent some time in the collective’s latest project, House of Eternal Return. The current installation is a full-size Victorian house that tells the story of the (fictional) Selig family, who mysteriously disappeared one night due to a phenomenon that dissolved the nature of time and space. Visitors walk through the house, interacting with light and musical objects and following secret passages in an attempt to solve the mystery of the Selig family. House of Eternal Return is no ordinary art exhibit, and Armgardt’s internship was no ordinary experience. She was able to work with UpSpring and Meow Wolf thanks to a summer fellowship from the Turner Family Center for Social Ventures (TFC). The fellowship provides funding for graduate students at Vanderbilt who want to pursue a social impact internship or project during the summer. Mike Woodnorth (MBA ’18), didn’t work out of a psychedelic art installation — but he did live with a client. Woodnorth interned at Threshold group, a Seattle- and Philadelphia-based wealth management firm focused on social impact investing. The pay at Threshold was below market for an MBA internship, but the fellowship helped cover the gap, which was particularly important giving the high cost of living in Seattle. In fact, that’s why Woodnorth lived with a client: since rents in Seattle are sky-high, Threshold connected him with one of their clients who owned a “mansion,” according to Woodnorth. He was able to rent a cheap room in the house and ended up becoming good friends with the client. Both Woodnorth and Armgardt were involved in the TFC prior to receiving their fellowships. Armgardt participated in the trek to eastern Tennessee to learn about social impact issues faced by the region and also competed in the Hult@ Vanderbilt event, which the TFC helps organize. Woodnorth met with Mario Avila, founding Director of the TFC, before school even started to ask how he could get involved. Ultimately, Woodnorth became a TFC board member, coordinating the Seattle trek and participating in other TFC programs. Avila ended up introducing Woodnorth to Teresa Wells, Director of Investment Strategy for Threshold Group, when she came to speak at a TFC event in the fall. “Mario made the initial introduction, otherwise I wouldn’t even have known that (Threshold) existed, probably,” Woodnorth said. Woodnorth stayed in touch with Wells and Threshold Group in the following months, even visiting their Seattle office during the trek he helped coordinate. After a lot of motivated work on his part, he received an internship offer from Threshold in April, around the same time TFC released its summer fellowship application. Armgardt was similarly proactive, presenting the TFC with a list of companies she thought would be a good fit. Professor Jim Schorr, who teaches classes on social entrepreneurship at Owen, introduced her to Drew Tulchin, CFO of Meow Wolf. Armgardt moved forward concurrently with Meow Wolf and the fellowship application process, eventually securing both the internship and the fellowship. Meow Wolf may seem like an offbeat choice for an MBA internship, but Armgardt actually comes from an arts and education background: before enrolling at Owen, she danced full time in a company and taught dance classes at Title I elementary schools. After seriously injuring her back, she began to consider business school and eventually applied to Owen. Woodnorth came to business school specifically to break into social impact investing. Before he applied to Owen, he googled MBA programs and saw that Vanderbilt offers the TFC. He was immediately hooked. Woodnorth and Armgardt may have taken unusual paths to secure their summer internships, but their responsibilities were fairly traditional for MBA interns. Armgardt interned within the financial department at Meow Wolf, identifying KPIs to measure for board meetings, researching additional ways to raise capital, and investigating potential exit strategies for current investors. She also worked on implementing a volunteer program for employees and helped with the B corporation certification process. “The TFC and my curriculum at Owen helped show me how you can use market-driven solutions to help businesses thrive, for profit or not for profit,” she said. At Threshold, Woodnorth looked for ways to improve efficiencies within the company, serving as a sort of internal consultant and completing several ongoing initiatives. He also worked in a research analyst role on several client projects. Both Woodnorth and Armgardt agree that their summer fellowships prepared them to continue their social impact work after they graduate while still leveraging their MBA degrees. They plan to stay involved with the TFC during the upcoming school year and encourage new students to join in early, like they did.